Hang in there, Kara. I'm so glad you get to have this time with your mom. We will keep you in out prayers. So sorry, Kara. Hang in there. Your mother looks like a very strong lady. Hey Kara, you have lots and lots of people praying for you and your family. We miss you! I have been thinking and praying for you and your mom. I met her only once, yet I was so taken by her and what an incredible woman she is. I am glad that you get to be with her. What a beautiful picture of you and your Mom. I'm so glad you get to spend this time with her. Hopefully you will get Stephen's passport soon! I am sorry for your loss. I am praying for you and your family. I was searching on google for Julianna Smith illustration and I randomly found your blog... after I read most of it and liked it I thought, I'll go ahead and click here and see how her mom is doing... and then was instantly shocked to see the word "obituary." It looks like your mom was a beautiful person. I am so very sorry for your loss. Thank you for sharing her story. I came across your blog and I wanted to let you know that I am praying for your Mother. 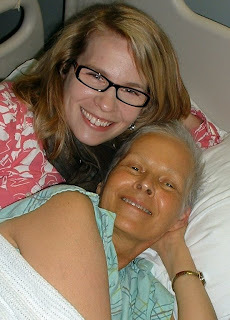 My mother had breast cancer and my sister had melanoma. Cancer is an awful disease and I am sorry you have to go through this difficult time.